Our series of tips to help you leverage the power of design and creativity to grow your business. This week: 06. 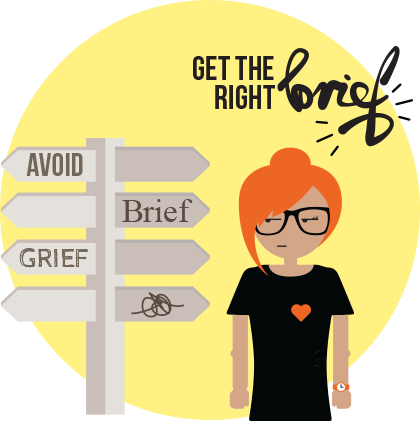 Avoid brief grief! Designers are only as good as the brief they are given. The more thought you give the brief and what you want to achieve, the more likely you are to have a smooth running project and a great result. But, while you need to spell out what you want to achieve, don’t be tempted to say what you think the design should be – that’s the designers job once they have the full picture. Try to be as concise as you can and don’t assume knowledge at the start of the project. It’s better to provide too much detail in the form of appended documents or other reference materials than to leave any question marks. And whilst it’s pretty important to get the brief nailed, you as the client shouldn’t be left to come up with the final results on your ownsome. A good design consultancy will work with you at the early stages to help you refine and tweak your brief to make sure it’s bullet-proof and engineered to get the right results. As you then move through all the subsequent stages of the creative process this blueprint will be the point of reference both of you can go back to for clarity – it ensures that every design step has purpose and direction. Think of it as a project’s GPS. The brief is not a one–way piece of communication – it’s equally important to get it right for both designer and client. Even if as a prospective client you already have your brief mapped out (and straight to the top of the class if you do!) – your design team should have some kind of reaction to it. They should come back with suggestions on how to develop or refine it further until it is spot-on. So, with all that in mind – if you find yourself about to commission a design partner who says they don’t need a brief, it would be a good idea to ask them why.